Tired of the same old Valentine's Day dinner plans? Looking for some great craft beer to distract from all of the fuss? Local Option doesn't care if your coupled or single, a romantic or a VDay hater - everyone's invited to this mixer event at one of the city's favorite craft beer bars. 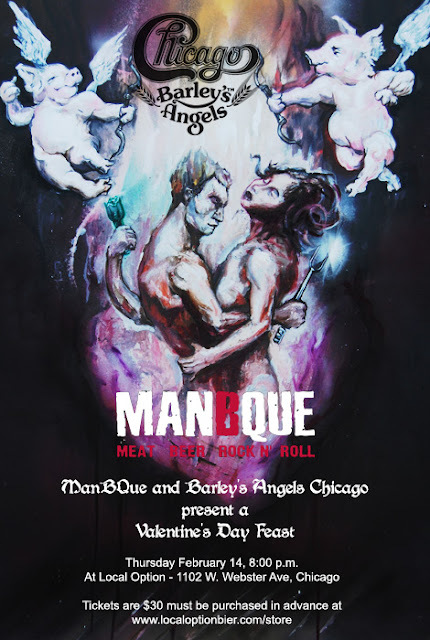 On Thursday, February 14th a three course meat and beer pairing dinner will be hosted by Chicago's own grilling club, ManBQue and ladies-who-love-craft-beer club Barley's Angels. Chocolate torte with bacon studded chocolate crust and boozy cherries. Barley's Angels is a growing collection of individual chapters around the world that work with craft beer focused breweries, brewpubs, restaurants, alehouses and other public beer establishments to advance the female consumer craft beer enthusiast, resulting in increased patronage and revenue from women, while encouraging education and interest in beer among this often under-recognized demographic group. ManBQue is a Chicago-based grilling club that holds monthly private grill-based MEATings, offers catering and culinary instruction, and pairs with local bars and restaurants for events that emphasize food, beer, and music. Started in 2007 as a males-only monthly gathering, ManBQue has expanded to co-ed public events, cooking classes, a line of sauces, and a grilling book coming in 2014 from Running Press. But as ever, they gather on the last Thursday of each month to sear meat, drink craft beer, and listen to music at ear-splitting volume. If it's loud, delicious, and/or smells of wood smoke, it's probably ManBQue-approved.